Works by 22 photographers from India and France are on display at prominent public spaces in the city in an attempt to bring artwork out of the gallery. The Rajiv Chowk metro station in central Delhi is perhaps the most chaotic place during morning rush hour. Commuters can be seen pacing around the station platform anxiously waiting for the next train to arrive. But on Wednesday morning, the scene was slightly different. Commuters paused to admire the large billboard-sized photographs of Bollywood stars spread across parts of the station — that of Amitabh Bachchan clasping a villain by his throat (from his film Shahenshah) and another showing the Kapoor family with Raj Kapoor, Rishi Kapoor, Randhir Kapoor and Rajeev Kapoor, dressed in black and white suits. While many happily posed next to them to get themselves clicked, little did they realise that these are photographs by renowned photographer Pablo Bartholomew, from his exhibition “Film Industry: Then and Now”, which is part of Fete De La Photo, a pan-India photography festival being held in public. In an attempt to take photography out of art galleries and into the streets for public viewing to make art accessible to all, more than 200 photographs by prominent Indian and French photographers such as Raghu Rai, Parthiv Shah and Shome Basu have been placed at different public spaces such as Central Park, Inner Circle, Palika Bazaar parking rooftop, Regal subway and Jantar Mantar. Organised by the Embassy of France in India, Institut Francais en Inde and the New Delhi Municipal Council, the festival also travelled to Mumbai, Hyderabad and Chennai. “We want to bring art out of galleries and into the public spaces through such initiatives and develop new audiences. I hope Delhi enjoys the festival and participates,” says Max Claudet, the cultural counsellor from the Embassy of France in India. French astronomer-turned-photographer Laurent Laveder, whose carefully crafted images showing people painting, throwing, catching and bouncing on the moon, are shown at the Jantar Mantar observatory as part of the astro-photography section, bringing together the works of other noted astrophotographers such as Thierry Legault and Ajay Talwar. Among such other photographs is Basu’s photograph at E block, of two Parisian girls trying to move a washing machine, which he shot in Rue Saint Antoine in Paris. “As a street photographer, I thought of giving back to the people whom I shoot,” says Basu. 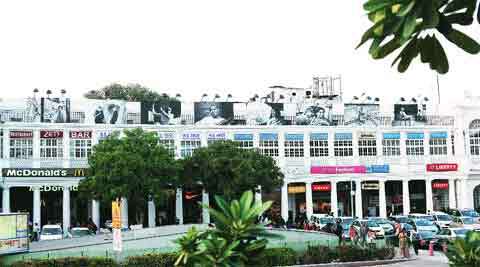 So, the next time you are at Connaught Place, go wander. Who know what works you may come across.